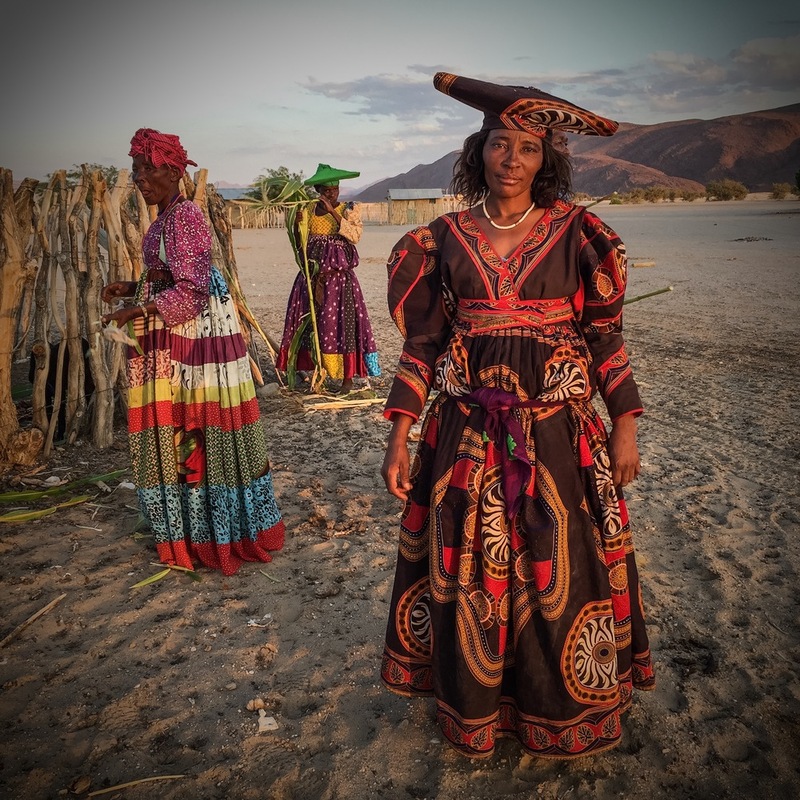 Two groups populate the remote northwest part of Namibia near the village of Purro, and trite expressions like "chalk and cheese" come to mind in describing the Himba and Herero. They share dark black skin and an apparent common ancestry, and the two groups peacefully coexist in this barren desert land. But it would be hard to mistake one for the other. The Himba live in tiny rounded huts built of twigs and covered with cow dung and random bits of cloth. The Herero favor tiny rectangular houses much smaller than a typical trailer—also made of dried cow dung. The Herero, however, have found a Christian God and a church sits squarely amid their structures. It is their dress that leaves you breathless in its diversity, although both groups are incredibly classy in their garb. The Himba wander nearly naked, breasts glowing and legs bare. Their butts are covered with wonderful brown furry strips of domesticated stock—primarily cow or the quirky looking goat-sheep. Their legs and arms are covered in metal bracelets and their necks wrapped in layers of necklaces made from bits of polished ostrich eggs and porcupine quills. Everything—skin, hair, and leather covering—is deeply soaked in a red powdery layer made by scraping a stone the color of dried blood—called an okla—on rough rock. This lends them an otherworldly glow as well as protection against sun, insects, and body odors. The Herero, taught by the nineteenth century missionaries to forsake their lewd nakedness, wander this same barren desert land dressed as if Alice in Wonderland grew up into a perpetual tea party with the mad hatter. Ruffled voluminous skirts cover bellies whose ideal form, I was told, is the hippo, preferably well rounded to demonstrate wealth. Jewelry is minimal, but head-dress seems mandatory. Imagine a visit to Ascot in high season, preparation transposed to a remote desert milliner's. The frame that forms the shape to meet a lady's fancy is a coat hanger lifted from milady's dresser, and instead of birds perched on blond locks you get a form of cattle horns perched over glowing black cheeks. Colors are bold, patterns vibrant, and designs seem unchanged from the days when the Christians arrived and the Victorian style still flourished.